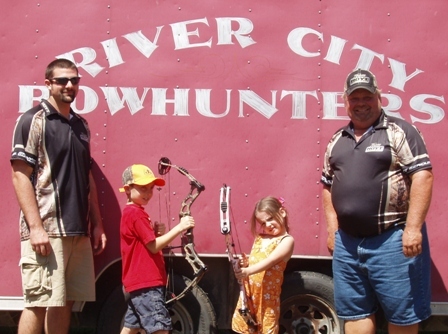 River City Bowhunters hosts 3D shoots at the Godfrey Illinois VFW farm. It is our goal to expand the sport of bowhunting and 3D archery. 3D archery is a fun and exciting way to hone your archery skills. A typical 3-D archery course will consist of 40 life size animal targets marked with scoring rings. Shooting 3-D archery courses will help improve your ability to judge yardage and shot placement. Increasing your skills in these two areas can only help you become a better hunter. Archers of all skill levels can participate in 3-D archery. Some shoot 3-D archery at a very competive level. However, the majority are bowhuters looking to improve their skills and prepare themselves for the upcoming season. What ever skill level you are, the main thing to remember is you are shooting against yourself, so relax and have fun. The targets you will be shooting at on a 3-D course will consist of various types of animals, ranging from deer, turkey, bear, elk, boar, and maybe even a skunk. River City Bowhunters is an ASA club, so we score according to ASA rules. Meaning, we score hi/low 12, 10, 8, 5, and 0. We do not score the ASA pro 14. Below is an illustration showing the scoring marks on a typical deer target. In addition to hosting 3D shoot, River City Bowhunter members are also very active in the hunting community, expanding the sport of archery and bow hunting. River City Bowhunters members provide youth a chance to shoot at 3D targets during the Shoal Creek Whitetails Unlimited Youth Day.